There’s an emerging look among border stories and cartel narratives. In this walkthrough, we show you how to use it in your own projects. In films like Sicario, or TV shows such as Breaking Bad, we see a trend: stories that revolve around a cartel or take place along the southern border of the U.S. — and they all get a muted yellow color grade. On the Roger Deakins forums, there’s some debate as to whether the yellow cast was intentional. Apparently, it wasn’t. However, if it’s become a recognizable element to let audiences know what’s going on (without spoon-feeding them), then I guess it works. In the video tutorial below, I run through the steps using HSL curves, as well as a quick adjustment on how you can make sure you correctly give your sky that muted yellow touch. As always, you can find a transcript of the tutorial underneath, in order to recap the steps. As with most creative grading, your base material is going to be incredibly valuable. 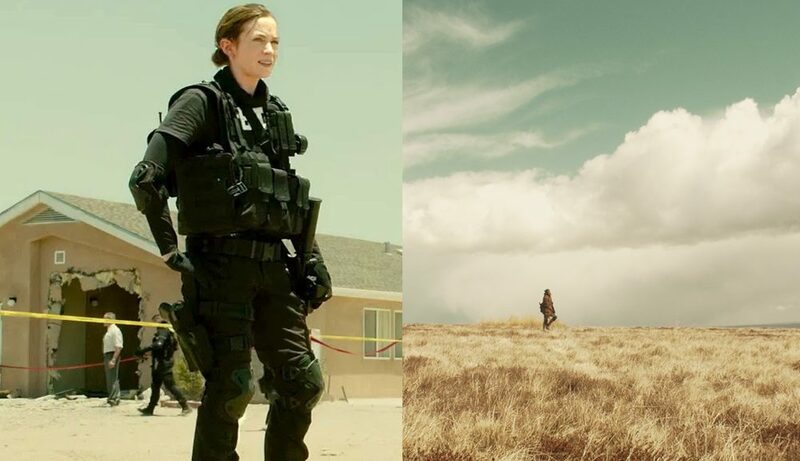 As with the case of Sicario and Breaking Bad, many compositions that used this grading have a vast, blue sky with dry, waterless dirt, or beige foliage. Quite simply, this grade wouldn’t work that well for a guy sitting in his office, against a white background. And, the concept behind these Sicario and Breaking Bad style grades is that they live in the world of realism. It’s not as abstract as a grade from Domino of CSI Miami, so, although there’s a distinctive look, it’s not as substantial as you may think. It just requires a slight tweak. Secondly, I want to note how we are going to focus on using HSL curves, in this tutorial. They are often overlooked, so I want to direct more attention to using tools that pack a powerful punch, when you need to adjust a singular element of the image. That said, let’s jump into it. This is our image. It’s a few years old, and it was shot on the GH4. To begin, I need to create a camera corrections node then add a second node and apply our correction LUT. The image, as you can tell, wasn’t shot in a log profile. It was shot in one of Panasonic’s Cine profiles. Therefore, the shot needs to be reverted to standard contrast and saturation. So, in order to do that, I’ll apply the Panasonic Cine-D to Rec. 709 LUT. However, in doing that, we can see it has slightly overexposed the highlights and blown them out. (Or, more precisely, I did not correctly expose while filming.) Therefore, we’re going to jump back to the first node and bring those highlights back in. You can now see that we have more visible detail in the clouds, which, in itself, is a nicely balanced image. Next, we’re going to create a new node, then create a parallel node. The top layer is going to be used to adjust the sky, while the bottom layer is going to be used to introduce our Sicario color. Let’s jump back to the upper node, and start playing around with our hue curves. Often, when we think about making color adjustments, we initially want to start pushing the primary wheels toward a specific hue. But, in doing this, we’re adding color to the entire tonal region. And, we’re not just changing a particular hue, even if that is what you see happening on your viewer. By using the hue vs. curves, we can selectively manipulate certain hues of the image. In this case, the sky. First, I need to select hue vs. hue, and grab a qualification of the sky. As we can see in the curve graph, the hue of the sky (blue) sits within this region. When we push the curve up, or pull it down, the sky is going to cycle through the selection of hues available. While we could push this up toward the cartel-looking yellow, the hue change is going to be too dramatic. And, as we’re working with 8-bit footage, we can see some elements of the image fall apart. Instead, we’re going to manipulate the sky to allow a color adjustment in the node below. Therefore, we have to nullify the hue in the sky and remove the luscious blue. With that, I’m going to move the curve and introduce more teal into the sky. Secondly, on the same node, I’m going to open the dropdown menu and change my selection to hue vs. sat. Upon making a selection in this curve, you’ll see that moving the curve point up will increase the saturation of the selected hue, while pulling the curve down will decrease the saturation. I’m going to decrease it slightly. Now, we still have a blue sky, but (in the vein of Sicario) it’s very washed and muted. However, it’s now missing that yellow tint. So, we’re going to drop to the node below, and begin introducing colors, to give us the intended look. We’re going to warm up the midtones, and do the same with the highlights but gravitate more toward the yellow hue. And that’s it. Job done. Of course, if this was a close-up, we’d likely have to correct the talent’s skin. But, before we’re finished, most importantly, I want to draw your attention to the hue curve node. Even though this didn’t seem like a huge adjustment, nullifying the hue of the sky was one of the most important aspects of the grade. As you can see, when I disable the node, it just doesn’t have the same effect. Looking for more tutorials? Check these out. Create blockbuster action scenes with Detonate, a pulse pounding collection of explosion effects for video.